I acknowledge with gratitude the Norwegian State Educational Loan Fund (Lånekassen) for financing and supporting my education with a scholarship here at the University of Tromsø. I am particularly grateful to the people and institutions that provided me with the necessary support for my education as well as the production of this thesis. I would like to express my sincere gratitude to Centre for Sami Studies for hosting me in the International Master’s Programme and providing me the fieldwork support. I am incredibly indebted to my supervisor Dr. Bjørg Evjen of the Centre for Sami Studies, for her scholarly and patient support, and sincere guidance in conducting this research from beginning to the end. The data collection process started in the second week in June 2010 and came to an end on 10th August 2010. 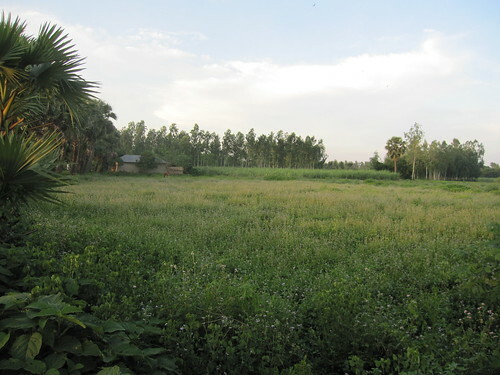 The fieldwork was conducted at Dinajpur district in Rajshahi, Bangladesh in 2010. Research reveals that indigenous people in greater Chittagong Hill tracts get priority even though the international concentration is on CHT. Consequently, other indigenous people in the rest of Bangladesh are struggling hard to sustain their own rights. They are apparently isolated by the majority Muslim and also inaccessible from outside world. The present underprivileged situation of Santal people and the increasing percentage of land loss in the North have encouraged me to select this area for conducting a research. The present research has been conducted at Phulbari, Chiribandar and Nababganj Upazila in Dinajpur District, Rajshahi division and it is estimated that Santal people are in larger group among the indigenous peoples in Dinajpur. The villages named Amlakathal (Union: Jaipur-1) in Phulbari Upazila, Bharkumari, Shimli and Patuatu (called Kachua in Bengali) in Nababganj Upazila, Choto Baul, Amaltala, Katapara in Chiribandar Upazila respectively, are the places where I conducted my research. Santal people who are enormously affected by the land and resources grabbing and various problems have been considered as participants of the present research. They were taken by using “snow ball” technique combined with women and men. Leaders known as headman, political leaders, farmers, housewives, school teachers, students, and NGO workers of the community have been selected as my respondents. Age of the participants begins with around 24 and comes to end to 90 years. I believe that every research begins with some questions and comes to end with the reasonable answers. I was born in the southern part of Bangladesh named Satkhira, where I had never been exposed to any people with different complexions, cultures, food habits, or clothing (different people; in a sense before my university level I had been introduced to only Muslims and Hindus). That opportunity came true during my university level education when I was student of first year in Dhaka University (DU). Every year around 6,000 students (combined majority, minority and indigenous people) get chance for the study in DU. DU gave me the chance to meet and mix with those students who came from different places, different cultures, and societies especially indigenous peoples. During this period some questions raised in my mind. Why are indigenous peoples different from other peoples? Why are their complexions different? Why are their languages different? Why is their dress different? I got reasonable primary answers when I met them intensively in the next four years. Later, my enthusiasm on indigenous peoples influenced me to conduct a research on Chakma indigenous peoples during my Master’s Degree at the University of Dhaka. For the second time, in 2009, the University of Tromsø unlocked an innovative window allowing me to accomplish my dream to study on indigenous issues. Indigenous land access in Bangladesh is limited at local levels as well as national levels, since indigenous peoples have no political recognition and documentary evidence provided by the government. The present research attempts to uncover the level of indigenous people’s land access on what is believed to be their informally inherited common property. It deals with the history of land access of the Santal people in different periods, from early ages to present day, and at a glance gives some geographical perspectives on land access in the northern-belt of Bangladesh. Practical questions according to an in-depth inquiry, along with snow-ball sampling accompanied by available secondary data on Santal people’s land access have been analyzed to uncover some reasons for this land loss. This study also endeavors to analyze some consequences regarding the problematic land access of the present period marked by disputes between the government and indigenous communities. The study also explores trends of protest by indigenous peoples in order to reclaim their access to land. The study shows that indigenous people’s access to land has highly fluctuated throughout different periods, escalating in the post-independence time and taking a critical shape at present. External and internal complexities inter alia complicated government procedures, indigenous peoples’ limited understanding on land ownership, political manipulation, majority-minority conflict, and language barriers have caused major discriminations for the Santal people in achieving their expected access to land. As a result of problematic land access, mass poverty and continuing social complexities have degraded living conditions in indigenous communities, particularly in Santal areas of Bangladesh. The study suggests that indigenous people’s protest and revolt against the oppressions may become fruitful if concerted initiatives are taken at individual, national, community and non-governmental levels. My heartfelt thank goes to Sami Centre. The funding from Sami Centre enabled me to spend the two and a half months of fieldwork period at Dinajpur. I am grateful to Sami Centre for their help. This entry was posted in Master and tagged 2010, Bangladesh, fieldwork, Master's in Indigenous Studies. Bookmark the permalink.